Harness the power of curiosity to foster students’ love for learning. From their youngest years, our children are innately curious. They explore the world around them through play, imagination, and discovery. They build meaning, they create understanding, and they unabashedly share their learning. It’s in this process that they find joy in life and relevance in the world around them. Bring inquiry to your K-7 classroom! A series of webinars introducing chapters and big ideas from Inquiry Mindset so you can hear firsthand our thoughts on how to make the most out of the book. A book club resource to bring to your staff and school to help truly build capacity and create lasting and meaningful change in your building! A companion resource to help maximize your reading of Inquiry Mindset. This resource will help you make the most of what we propose. It will support you in planning, taking action, reflecting and growing. Exclusive access to high res versions of each and every sketchnote in the book for you to print off, use in your classroom, and share with your PLN. Why do some of our students become disconnected from their learning in school? Where does this natural curiosity go? And how, as educators, can we ensure all of our students experience a meaningful and wonder-filled journey through their education? It’s these questions that Trevor MacKenzie, author of the critically acclaimed book Dive into Inquiry, answers in Inquiry Mindset. 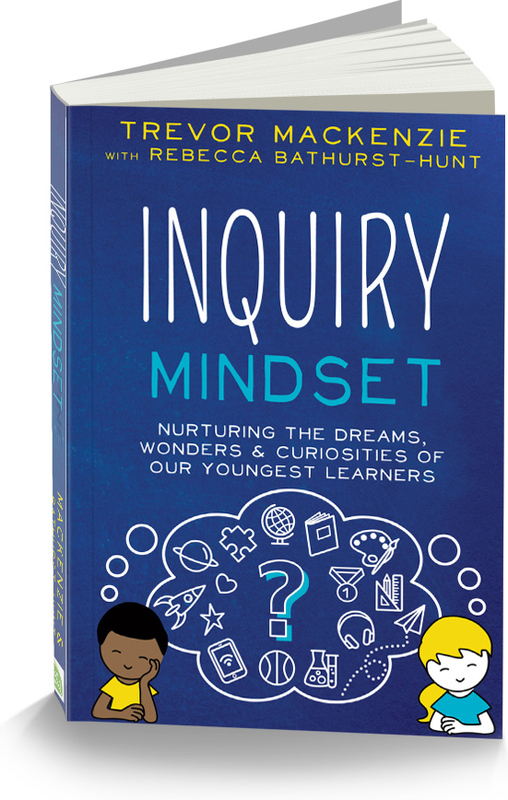 Co-written with kindergarten teacher Rebecca Bathurst-Hunt, Inquiry Mindset offers a highly accessible journey through inquiry in the younger years. You’ll learn . . .
How to empower your learners, increase engagement, and accelerate achievement. How to harness the wonderings and curiosities of your students and leverage them into powerful learning opportunities. How to adopt an inquiry approach that results in the most authentic and inspiring learning you’ve ever experienced! Student engagement shines through in every chapter as [they] provide a plethora of familiar as well as innovative tools and methods that can help foster inquiry in any classroom. A touching narrative bursting with inspiring yet practical ways to honour student curiosities, Inquiry Mindset will transform your teaching! Love the book? Use the #inquirymindset hashtag to help spread the ❤️!